Based in Southern California, Eiji Mori serves as executive general manager of Innovative Dining Group’s Sushi Roku, a Newport Beach restaurant that offers customers an authentic Japanese culinary experience. Among the dishes Eiji Mori's restaurant serves is A5 wagyu ishi-yaki, premium Japanese beef grilled over binchotan, a charcoal that produces intense heat but virtually no flames. Integral to Japanese-style grilling, binchotan utilizes kilned Japanese oak that burns with significantly more heat than the seasoned oak employed in most wood-burning ovens. Depending on the type of binchotan used, the charcoal can burn for three to five hours and reach temperatures upward of 2,200 degrees Fahrenheit. However, igniting the binchotan can be a lengthy process--because it’s hot enough to melt stainless steel, often the charcoal is placed in a dug-out sand pit well away from anything that might catch fire. The binchotan grilling technique is used for a variety of traditional skewered meats, including yakitori chicken and unagi (eel). The charcoal is carefully placed and the protein skewers stuck vertically in the sand around it. 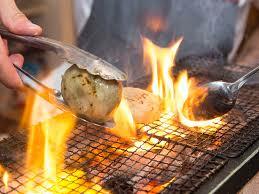 The grill period typically ranges from 20 to 40 minutes. The end result is a protein that features crisp skin and moist interior meat, as well as a deep, muted smokiness. Originally from Japan, Eiji Mori is a respected restaurant executive and manager who leads Sushi Roku Newport Beach in Orange County. In this role, he oversees a dining establishment that offers a select sake menu that pairs with premium meal options. Eiji Mori’s restaurant, part of Innovative Dining Group, has an affordable lunch menu featuring items such as poke bowls and chirashi with miso soup. 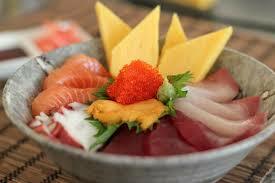 Also known as chirashizushi, the latter dish is comprised of pieces of sashimi with a vinegar-rice bed. Coming from the Japanese word “scatter,” the entree has modest beginnings. Traditionally, it was employed as a way of using leftover fish after the choicest pieces had been used for nigiri and sashimi platters. Today, chirashizushi’s popularity has made it a premium dish that artistically combines items such as cooked and uncooked fish, tamagoyaki, prawn, roe, and pickled and raw vegetables. The more humble bara-chirashi version also continues in Japan as a family staple that can include virtually any ingredient. "Sake 101 with Sake Sommelier Eiji Mori"